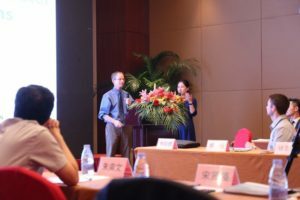 In July 2017, Brad Granley from LMS was invited to speak about the WAIV wind evaporation system at an international conference focused on environmental and wastewater technologies in Shanghai, China. Attendees of the Conference of Anhui Environmental Technology Industrial Park were from governmental agencies and private industry. Brad spoke about how WAIV works and the benefits of using the technology for wastewater evaporation.